Hey Stampers, it's that time again.....whoo hoo, the weekend, and a Saturday Sketch Challenge for you. Here is the Challenge for this week and it's SB3 and here is my samples. There are two versions of the same card. One is simple and one is what is called a Stepped-Up version of the card - which means there is some added elements, techniques, accessories, layers or just added difficulty. 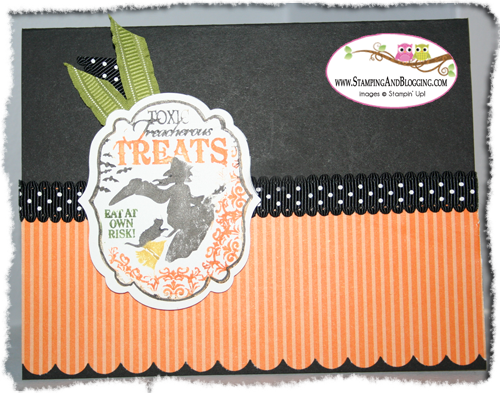 This card simply uses the Basic Black card stock and Pumpkin Pie designer series paper (of the Brights collection). Scallop Edge punch along the bottom and also scalloped dotted ribbon! The Framelit piece is colored using the Markers technique but you could have made this card really simply and just stamped it in black only. 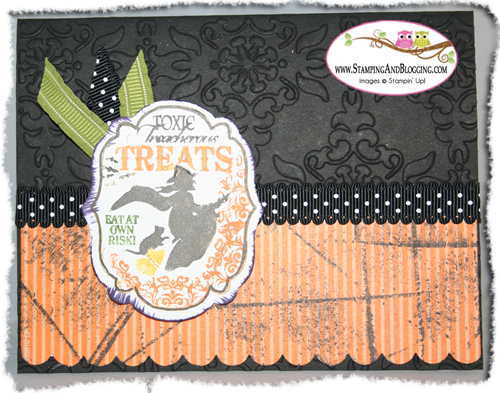 But I used Green Gumball, Pumpkin Pie, Summer Starfruit and Basic Black Stampin' Write Markers. My favorite technique to use during Halloween is one that I don't even know if they have an official name for. See the marks and smudges on the Pumpkin Pie designer series paper? Those marks were made by me by holding the Pumpkin Pie paper in my hands (you may also lay down on Grid Paper) and then pressing the Basic Black Classic Ink Pad down, forcing some smudging and so of the hard edges to appear. You may also use some of Stampin' Up! 's background stamp such as Netting to add texture as well. But this look is as unique as you are and you can add as much or as little as you want! Last but neat least, notice the edges of the Framelit piece. I also took the ink pad and scraped it against the edges. So yes, that look is intentional! LOL. Be sure to come on over to Stamping and Blogging (the Blog) and check out all the entries for this week's sketch challenge, and hope you'll submit your own samples as well!